WikiLeaks editor-in-chief Julian Assange makes his case at Kensington Town Hall. Photo by Sophia Spring. This is part II of our report on the special debate, “whistleblowers make the world a safer place,” organised by the Frontline Club in collaboration with New Statesman magazine. Part I can be found here. It was always going to be fascinating seeing former CIA agent Bob Ayers share the stage with Julian Assange. It is well documented that the WikiLeaks editor-in-chief has been trailed by intelligence agents many times before – but rarely has he engaged with one head on in a public debate. Former head of risk at the bank HBOS, Paul Moore was next. Moore spoke out in 2009 after being made redundant for blowing the whistle on alleged recklessness at HBOS. Quoting the bible, he said that whistleblowers are necessary as we are “transformed by truth”. Expressing his disapproval that a whistleblower was not on either panel, Moore also blew a whistle on stage in protest. “Whistleblowers prevent disasters but they get treated like toxic waste or lepers,” he said. After contributions from the whistleblowers, chair Jason Cowley read out a question submitted by the audience. The question was based on a common criticism leveled against WikiLeaks – that the information they have published could, in some instances, put lives at risk. What about the “collatorial damage”? Cowley asked Assange. The 39-year-old Australian stepped forward and confidently proclaimed his belief that “WikiLeaks has never got it wrong”. The Pentagon, Assange said, had more blood on its hands than WikiLeaks. Next to take centre stage was Question Time heavyweight, New Statesman senior editor and Ed Miliband biographer Mehdi Hasan. A natural orator, Hasan’s passionate speech was immediately hailed on Twitter as the best of the evening (even before the final speaker, Douglas Murray, had got his chance to speak). “That is what whistleblowing is all about,” said Hasan, “and that is why it is so important. Hasan then questioned the political right’s fear of whistleblowers, urging support for the motion “whistleblowers make the world a safer place” for the sake of the whistleblowers themselves. “Whistleblowers empower us all by exposing the truth,” he concluded. 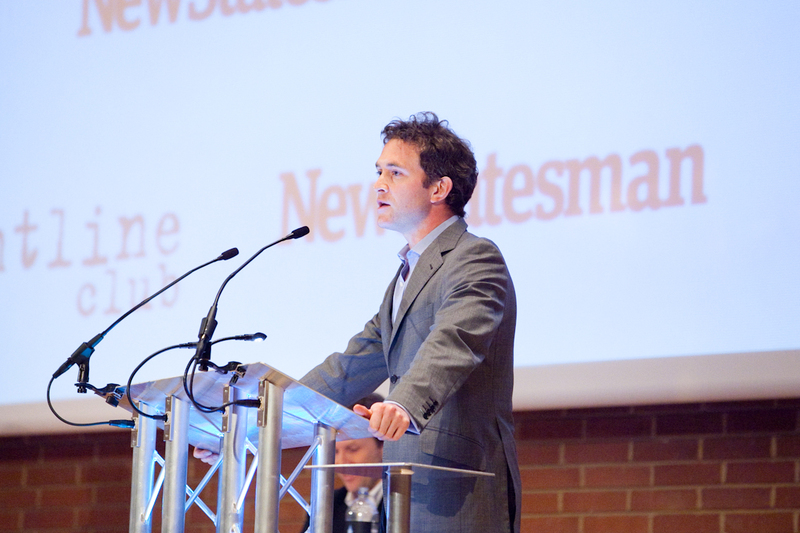 A ubiquitous commentator, author and journalist Douglas Murray is often touted as the UK’s only neoconservative. Murray began slowly, building up his argument towards a gradual crescendo. Reiterating a similar line of argument taken by his fellow panelist Sir David Richmond, Murray spoke about “checks and balances” and said he didn’t believe it should be up to “leakers” to decide what we know. Looking at Assange, he then went on the attack. “Do the leakers – do WikiLeaks – know what they’re doing?” he asked. exposed wrongdoing in countries such as Russia and asked about WikiLeaks sources of funding. “What gives you the right to decide what should be known to governments and what should not? Midway through his speech, each member of his opposition – Assange, Swisher and Hasan – attempted to make an interjection, but were sent back to their places by a firm Murray. Assange was eventually allowed to make a ‘point of information’ when Murray repeated a claim – made by the Guardian’s David Leigh – that he had stated Afghan informants deserved to get killed. Assange responded: “Lies have no social utility, the truth has a social utility. The abuse of libel laws is a terrible thing. That is why I was involved in constructing the world’s strongest libel legislation, in Iceland, to protect us all from the abuse of libel laws, and have complained constantly here in the UK. 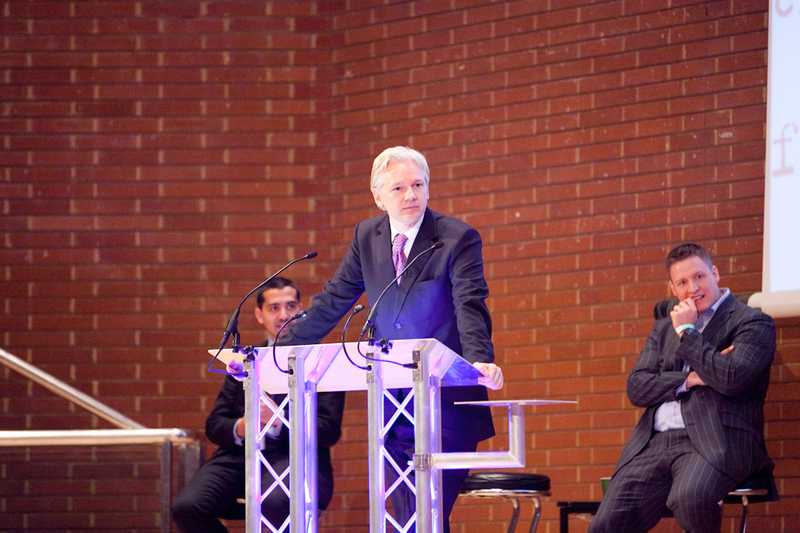 Moments later, due to the delays at the start of the event, Assange was forced to leave the stage early in order to meet the conditions of his bail. A vote was cast while he was still on the stage, which showed little change in the audience’s opinion. The motion, “this house believes whistleblowers make the world a safer place,” was passed overwhelmingly and the debate was concluded. Many thanks to all those who came along and made the event a great success! Full video footage coming soon. All photos by Sophia Spring.